Are you Trying to Find a Good Children’s Dentist- Read this First? Looking for a Great Children’s Dentist for your Family? Are you looking for a good children’s dentist in Maroubra? 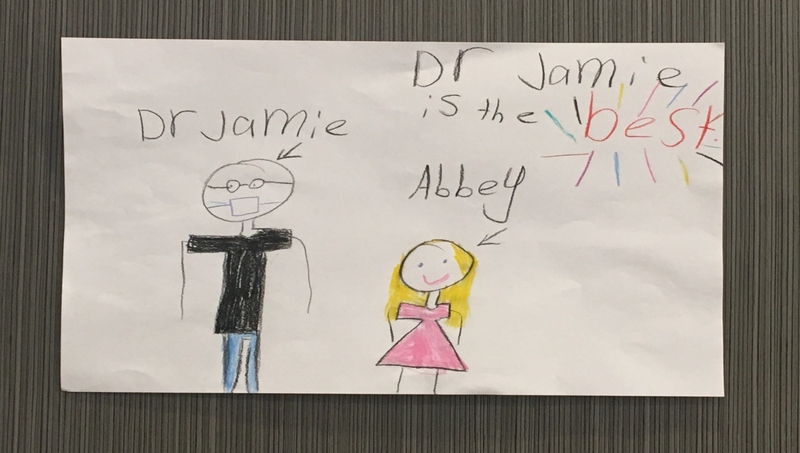 Dr Jamie is very proud of the way children are cared for at the Maroubra Practice, and being family dentists in Maroubra, he see lots of children’s teeth. Children shouldn’t grow up being scared of the dentist – as was so often the case in years gone by. We have come along way in terms of equipment but also we are very lucky in Private Practice in Australia that we have more time to spend with the children. “I always take my time with children – making them feel safe, building their trust and creating a relationship with them. Visiting our affordable child-friendly Maroubra Dental Practice will- strangely enough- become quite a fun process for children; many of our them, actually like coming to see us. If you live in Maroubra, we’re central to you- just off Anzac Parade – feel free to give the Practice, or Dr Jamie a call anytime. What outcome do you want for your child’s teeth? We think that this is a really good place to start (as with a lot of things in life). When it comes to your children’s teeth, a good suggestion would be: to have a lifetime of healthy teeth needing little or minimal attention: to establish good habits and to have a trusting relationship with a good children’s dentist. There are two pieces of good news here: firstly, children are a blank canvas- so we start as we mean to go on; secondly, – this is surprisingly easy to achieve! We’ll discuss the ‘how’, as you read on. There’s a bit of work that goes into achieving success, especially in the early stages, but once the foundation is established then maintaining it is simple. Get that foundation wrong however, which is also easily done, and the picture changes very rapidly and sadly, this is where many adults find themselves today. It’s a slippery slope and one that you don’t want to go down from all perspectives: time, money, pain, discomfort and worry. Generally speaking about three years old- but as you will see they should be familiar with the dentist long before they actually ‘sit’ in the chair. By far the worst-case scenario for everybody involved and I mean the child, the parents and me the dentist is… if the first time a child ever sees a dentist – they are in pain. You are taken to see the dreaded dentist. Your parents have been telling you for the last month “not to be scared”, “that you are a big boy (or girl) now”, “that it won’t hurt” and you are wondering why are they telling you all of this if there is actually nothing to worry about; so you are already a little nervous. You walk in and there are other people sitting in the waiting room, not looking too happy, and then the dentist, who you have never seen before, appears in a lab coat, looks at his clipboard and calls out your name. You are marched down the corridor with mum glancing nervously at dad and your sister who isn’t being treated with the biggest grin on her face you can imagine. As you enter the room there is a funny disinfectant type smell and a super weird looking chair with a light and cables coming out of everywhere. That doesn’t look fun you think and you are encouraged to sit in the chair which you do. The dentist asks you to point at your sore tooth. You point to the tooth, whilst mum is saying how you have been complaining that it hurts. A lady nurse appears and smiles at you, which is re-assuring and the dentist says he is going to lie you down. At that precise moment the chair starts moving abruptly and continues backwards, not just a little but all the way- it feels like you are going to fall off. The dentist drags you to the head of the chair, as you’ve slid down a fraction. They are both now wearing masks and funny glasses. They peer over you and the dentist asks you to open. They’ve just put some glasses on you too, when the light overhead flicks on and brightly lights up your nose and your mouth! You are asked to open wide again – you oblige – without any warning, the dentist starts picking at your tooth with a sharp instrument. You can’t help but flinch and then, again without warning, a load of water is sprayed into your mouth from a little device in their hand. The nurse reacts immediately grabbing this noisy tube, which she also shoves in your mouth pushing your tongue out the way; it gurgles as the water disappears. The dentist blasts that same spot with a big puff of air… right on the sensitive part again. The dentist is talking over you to your parents, saying something and mum is nodding anxiously… you’ve no idea what is going on. Then the nurse, prizing your mouth open, forces in this awkward chunk of plastic- she tells you it will help keep your mouth open- you don’t like not being able to close your mouth especially when you’re lying so far back. Now, you hear an awful whirring sound, the dentist has picked up another tool- it sounds like a high-pitched drill- not a friendly noise. The awfully loud sucker thing appears again and both dentist and nurse lean over you with intense looks on their faces…. You are beginning to get the idea. And, we haven’t even talked about having an injection: the fact that it may sting and even if by some miracle it doesn’t, then it’s going to make your face feel like it’s the size of a football – you’ll look and feel like a lopsided monster; or the drill that removes decay which vibrates so much that your brain rattles inside your skull. Now everything we talk about here does actually happen: we can’t change that fact. We may have used some emotional words to embellish things, but it’s easy to see how that could actually be a child’s experience. So, what can be done to change and influence the feelings and perceptions of each piece in the puzzle? How can you prepare your child for a visit to the dentist? Children are super perceptive sponges and they soak everything up. You ‘do’ something or say something and before you know it, they’re copying you! That, as you know, includes all the good things that you want them to copy and all the bad things you don’t! They pick up both your conscious and unconscious actions- those that you do intentionally and those that you don’t even know you are doing. Take for example a parent who hates the dentist: they may say all the right things but it’s hard to fully disguise the tone of your voice or the micro- movements of your face – these often tell a different story. Even if you’re fully on guard when your children are around, the chances are, that at some point you might forget, and when you do… there’s a chance they’ll overhear the ‘oh so powerful truth’, then you can’t go back! It’s like the moment when they find out Santa Claus isn’t real. So, ideally, we see children for their first visit at around 3 years of age. “I would suggest – assuming mum or dad are actually good patients and not terrified of the dentist – bringing them to the surgery to just have them sit in the corner watching, whilst you have something simple like a check and clean (not an extraction!). This introduces them to pieces of the puzzle: the dentist, the room including the chair and also they’re learning what to do and that it’s ok… because mum or dad are doing it and they are safe. On the second visit, I may at the end of the appointment, just have the parent sit their child on their lap or, if they’re brave, sit alone on the chair for a quick ride and maybe, we might have a cheeky peek inside and count of their teeth. It’s a great opportunity to chat about looking after the teeth too and will start to frame the dentist in a positive light. If it doesn’t feel like a positive experience for the child, I’d simply try again next time… It’s all about creating the right atmosphere! If you have one parent who is not great with the dentist, then they shouldn’t be the one to bring the child, at least for the first few times! OK, let’s talk about a couple of behavioural concepts before we continue. It’s much easier to get things right from the start than it is to back peddle and try to change the frame, or the interpretation of something that has already happened. Once it is wired in, it’s ten times harder to reverse. Just think about someone doing something that you don’t agree with – how quickly we judge that person and how long it takes and how many future interactions are needed before you’re able to change that initial feeling. “This one wobbles, and I mean wobbles – not a little but a lot and it’s that wobbling, that not only tickles but tells you that the little spoons are working… can we try it?”. Statements like these tell the child what to think and influence how they feel, so there are no surprises! “If I don’t tell them – before their tooth goes to sleep – that ‘the anaesthetic is going to feel spotty, itchy, or tingly’, they will worry when they feel a strange sensation in their mouth. Furthermore, if I don’t tell them that when I’m giving anaesthetic that ‘it sometimes feels super cold, almost like a pinch,’ we risk losing their trust and our ability to carry out the treatment. If this is their experience, we can maintain their trust; we have been honest with them, and moving forward will be much smoother. What happens when a dog is good and follows our instructions? We give it a reward. This is creating a positive anchor, meaning the dog is more likely to repeat the behavior. We as humans are no different. If we get a reward for something, we are much more likely to do it again – common sense! We are motivated, to move towards pleasure and away from pain, by the chemicals and emotions in our bodies…so, by creating positive experiences and anchoring them in a given situation, a child is more likely to be happy, compliant and accept treatment without protest. “Johnny, wow I’m impressed, you have been so good today. I can’t believe this is your first visit. Do you think little Johnny is more likely to repeat this behavior after being praised so much? “I know you haven’t opened for me today but that’s ok, you can practice at home and we can have a proper look next time. I’m just going to talk to you, and give you a ride in my chair – if you’d like one? If your child has had a bad experience, it’s one heck of an uphill battle to get them back on track. A further point to note: anchoring something positive with a reward is very very different from bribing a child to get them to do something. ‘If you do this we can go get ice cream (or some other sugary snack) afterwards’- insert face plant emoji. the child very rapidly realises that they have bargaining power and are likely to exploit the situation again. If you got a 10% discount from your hairdresser once, and they didn’t tell you it was a one off, would you expect it next time? Probably! Would you ask for it? Maybe! Would you be more unhappy, when they refused the second time, than if you had never been offered the discount in the first place? We are just suggesting that you keep the bribes up your sleeve as a very last resort. Taking something away is often more powerful, but you need to make sure you follow through if you threaten something! “I will reward them and positively anchor in the experience with a high 5, a photo and a sticker or two or a toothbrush”. What sort of Language should you use? You need to be very careful, as does your dentist, to only ever use positive language! We can’t process negatives in language so if you hear for example, ’Don’t think of a blue cat’, – you naturally think of a’ blue cat’ before you can ‘not’ think of it. And if you do have to use negative words, and there are occasions where it is necessary, try to use those that have less negative emotion and association with them. With children, it’s much easier to be told something may be a weeny bit uncomfortable than that something will be a little painful. We shouldn’t tell lies, as this can easily backfire and break the trust. Here we can ‘frame’ language appropriately and plan for the worst. If you get asked questions that you aren’t sure how to answer, then by all means get in touch and I’ll tell you what I’d say. Remember… always be positive, never promise or lie, and if you’re unsure ask me. Frame it positively in the first place! What should you say to your child during the appointment? This is where most parents’ anxious side comes out – usually in their body language, their energy or in their language. Even so-called encouragement – as in the examples out-lined – more often than not back- fire. Generally, you need to say as little as possible. Simple phrases and positive reinforcement are good. ‘How awesome is the chair – don’t you wish we had one at home’ “. Make sure you keep the energy and the tone positive. All these statements stack weight under the notion that the dentist is a safe and fun place. What should you say to your children after the appointment? Don’t slip up here, parents often in their relief will slip out, ‘Oh, you are such a brave little soldier,’ or ‘You are so much better than me’. Be really careful not to do this! Re-enforce the positive words and phrases that you used during the appointment. Ask them what they liked about the dentist. This forces them to think positively. Encourage them with comments like, ‘So we need to make sure we brush twice a day every day, so that when you see Dr Jamie in 6 months, he will be impressed at how clean your teeth are’. Reward and praise them (anchoring) for: how wide they opened… how well they behaved …how great and sparkly their teeth now look. You get the idea now! “ If they need to come back for treatment, I will have pre-framed what will happen, so just repeat the things that I’ve said: ‘You know there will be some funny feelings, but Dr Jamie will explain everything again before you start so you know exactly what to expect’. Can you prepare your child for the dental environment? Well, as much as possible you need to control what they see and hear regarding the dentist: this will shape their experiences, their thoughts and their feelings. If you have laid down the foundations, and they have already been to the dentist a few times before they start talking about ‘the dentist’ at school with their friends, or seeing things online, or in the media, then the game is largely already won. Use all the skills and strategies that we’ve been talking about, and they will see their dentist as a force of good health. Be positive and talk about your visits in a positive calm manner. Take them to see the dentist ‘early’. Leave the ‘fear’ environment to others to shape and form their own beliefs; you have very little control over it anyway. It’s so much easier to deal with comments like…Today, ‘so and so’ said the dentist is scary, if your child has already been to see me and we have established a strong healthy relationship. How do we introduce the equipment? Well let me show you…. What could you expect on your first dental visit to Dr. Jamie? “Different children naturally have different levels of trust. Some are extrovert and easily trusting, some are more shy and take longer to warm up. Either way I’ll do the same thing and build the relationship layer up on layer. All the tools we have talked about are designed to help them gain confidence and trust in me. They need to know everything before it happens, what they will see, what they will feel, what is going to happen, now, later, next visit. Surprises in the dentist are a bad thing so we need to cover all the avenues up front. I need to move as slowly or as quickly as your child will allow. If all the positive work has been done before the first appointment, most of the time, I can check their teeth, introduce all the tools, clean the teeth and put in the fluoride mouth guards or I can paint it on. If all they manage is a ride in the chair, well so be it, we’ll bring them back and give them another ride and try and progress to a quick count of their teeth- bit by bit- It will come together. From the moment they meet me, my energy will be aligned with theirs, I will be happy, positive, fun and friendly and talk to them as my friend and together, we’ll be the most important people in the room. When I sit down to talk to them, I will move the chair up so we’re eye to eye. I will speak with an infectious passion and excitement and give them my full attention; just reflecting to mum or dad as required. I’ll pat them once or twice on the arm or on the knee to breakdown the physical barriers and ask them questions and then listen carefully to their answers. I can’t tell you how many times parents have come up to me and said, ‘Wow, that’s a bit different – wish you’d been my dentist when I was young’ or words to that effect. Kids draw me pictures and even ask their parents, ‘When do we get to go to the dentist again?’- the ultimate compliment! It’s a team effort- your child, the nurse and me- if they want a little break, they simply give me a little wave. I’ll ask them to give me a couple of seconds, whilst we pop everything out of their mouth…this technique is great for fillings and extractions. So what if they need treatment on their first visit? “Well, to be honest, it’s your responsibility to ensure that this isn’t the case- the only time would be for a trauma situation, otherwise you really need to do all the things we’ve been talking about; ensuring that the only outcome on their first few visits is a good and positive experience. If they do need treatment, I’ll do the best I can, but there is no substitute for layering in over time all the things we all need to do. Sometimes we get away with it, sometimes it’s a struggle and sometimes I simply can’t do it if I don’t get enough co-operation to proceed with the injection, clean the cavity, place a filling or whatever needs to be done. In such cases, I may need to refer to a pediatric dentist for treatment, perhaps with sedition or even under a general anaesthetic. What I won’t do is get your child through the procedure at any cost. One traumatic experience could frame all dentists in a negative light for a whole lifetime, as many of you adults know! This can mean all sorts of trouble and problems down the track, if you do not see your dentist regularly. Those who end up attending only when they are in pain are the ones who need extractions and root canals not just simple fillings. They are the ones whose gum disease progresses to unsalvageable levels and ultimately end up wearing false teeth of some sort. It is so easy for me, as a dentist to connect the dots, and I will repeat myself: start your children early with positive experiences; get the habits right; have regular visits and you set the family up to win. Very rarely and preferably way down the track, it may be necessary to refer a child onto a pediatric dentist (these dentists only deal with children); there they have the option of sedation or general anesthetic if required. “Ok here you will find some cool little nuggets to positively introduce the idea of visiting me, or for that matter any dentist. The more of these you do… The better! Modeling – If they have a brother or sister who is a little older and good with the dentist, then it works wonders for them to be in the surgery and watching how to do it. If they aren’t good with the dentist, this can set up some anxiety so it may be best to watch mum or dad instead. Whoever likes the dentist the most and is the easiest to treat. Modeling is best done a few times before they even get chance to sit in the chair (unless they want to)! Role play– By all means pop in and grab a mask and some gloves so that you can take it in turns to practice being the dentist and patient and opening wide and counting teeth. Use the language we have discussed- be positive, make it fun with lots of compliments! Getting them to play the part of the dentist really helps! Stories– Reading stories about the dentist is great but you do need to be a little careful when selecting the book. I’ve seen some shockers with pictures of scary dentists, equipment, worried faces on children and even those that mention all the words I’ve told you to avoid- pain, injections even needles… I mean seriously! Check out this image in a book! Nothing good can come of this… Even with the statement, ’The dentist isn’t scary like some children imagine.’ It’s a disaster and it is for that reason that I like to choose a book that is more of a metaphor and uses animals or at least cartoons instead of people. It’s a much safer and a more fun way to introduce the dentist. Last but not least is the meet and greet. This may have already happened whilst you, the parents were being seen or a brother or sister, which is great. It’s the subtlest and best way but not always possible. So there are another couple of options, I would recommend: pop in for a couple of minutes to say a quick ‘hello’- I maybe able to come out into the waiting room to show them the room- maybe not, but just to say ‘hello’, and say how I am looking forward to having a little look at how well they have been brushing. “I think it is apparent, if you have read this far that I’ve spent considerable time thinking about how best to treat children. That’s why I write all this content myself and why I show pictures of the actual surgery and me with actual patients. I don’t want you to be disappointed, rather have faith that you have chosen the right dentist for your family. My approach has always been that you, your children and I are a team – I use descriptive language that the children relate to and have friendly names for all my tools. I start early and get them used to us doing simple, easy things in their mouth. Your children will be in good hands and they may even become [in your mind] ‘oddly’ excited to visit us… happens a lot! You just need know that they’re in good hands and that I honestly will do everything I can to look after them. So, get your children into good habits! What are the good habits Dr Jamie is talking about? They are the simple stuff that most adults tend not to do out of sheer laziness… like flossing every day. Hopefully, you will do more for your children than you do for yourself. 1. Diet- limit refined sugars as treats and for special occasions. Keep sugar free of bedtime and nothing after they have brushed their teeth except water. Sugar is in so many things so just be aware- drinks are especially damaging. 2. Cleaning- brush morning and night as best as possible. Let them do it as soon as they show an interest but make sure you have a little go after wards until they can do a good enough job. There are some great brushing YouTube songs and videos- (I’ll do one myself one day! ), but find something they like and then play it all the time. Anchor it in and make sure you have a bedtime routine that you always follow… It’s so important. Make it fun, make it a game and you be surprised the amount of tooth brushing you can do. 3. Fluoride- low fluoride toothpaste for children under 6 – Colgate does a range for different ages. This is because some kids like the taste and as a result sometimes want to eat it. How about ‘fear’ of injections? One of the biggest fears parents and children have is needles and having injections. ”I use topical cream to numb the surface, warm the anaesthetic to body temperature and apply it very slowly. The children sometimes feel a very cold little pinch but most of the time with their eyes shut and wiggling their toes (my distraction technique! ), they really don’t feel a thing- except pins and needles, as it starts to go numb. I talk to them all the time and I know that kids have a 6th sense for something that may hurt, so I approach it with such ease and confidence, that they feel totally re-assured. Amazingly, it feels huge and they can’t believe when they look in the mirror and see that everything looks almost normal. Giving anaesthetic in this painless way means the tooth can be treated much more easily without sensitivity, pain or worry from the child or parent. What are your other areas of specialist interest? A dentist often has an area of specialist practice, this could be family dentistry or cosmetic dentistry but is more likely to be an aspect of one of these such as veneers or dental implants, they aren’t a specialist per say but rather have a ‘specialist interest and tend to perform more of that type of dentistry or procedure’. I am a trainer with AADFA – the Australasian Academy of Dento- facial – Aesthetics, teaching Botox and filler training to dentists. I personally provide, not only amazing skin advice, helping you develop a regime that is backed by science not marketing, but also Botox, lip filler, together with other cosmetic injectables: micro-needling, thread lifts and chemical peels. Dentists know the head and neck anatomy better than most, and have a keenly developed aesthetic eye. Our sterilization procedures at the Maroubra Practice are of the highest standards.